A northeast native, I’ve called the D.C. metro area home for over 20 years. I’ve always had a passion for real estate. Even as a kid, I’d ask my parents if I could join them while they toured model homes. Little did I know that 20 years later I’d be the one bringing clients through model homes and negotiating sales on their behalf! As a Realtor, I’m customer-driven, and always dedicated to exceptional service and results for my clients. 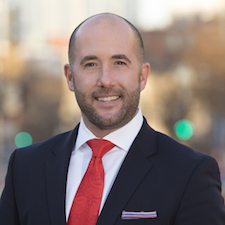 I’m licensed in D.C., Maryland, and Virginia, and I specialize in representing both buyers and sellers in the purchase and sale of single-family homes, row homes, townhouses, and condos throughout the D.C. metro area. I’m a graduate of Walt Whitman High School in Bethesda and I hold a degree in communications from the University of Delaware. My hobbies include biking, D.C.-area sporting and social events, boating (especially when I have the opportunity to take my clients out on the Potomac), hiking, and helping out where I can in the community. I truly love the D.C. area, and I put my passion and deep knowledge of the area, along with 10 years of real estate experience, to work for each and every client.